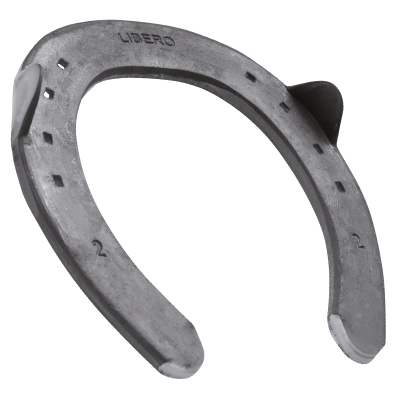 The new Mustad LiBero is a 3/4 fullered all-round horseshoe. The LiBero is suitable for most leisure and sport purposes with a wide variety of sizes and sections. It has been designed thanks to the collaboration of an extended farriers team, formed by eminent specialists from France, Germany, Great Britain, Holland, Belgium, Denmark, Norway and Switzerland. The main objective has been to respect as much as possible the natural shape of the hoof, providing the best support and protection for the horse while making farriers’ life easier when shoeing. Has a left and right shoe. The outside branch is clearly marked in the fuller and is always slightly longer with the nail holes punched a fraction coarser for optimum fitting and nailing on. The bents of the inside and outside branches follow the physiological shape of most European breeds. A moderate form of sole relief now starts 1mm after the white line. This ensures that no part of the sole will be weight bearing without increasing the risk of a stone lodging between the shoe and the sole. 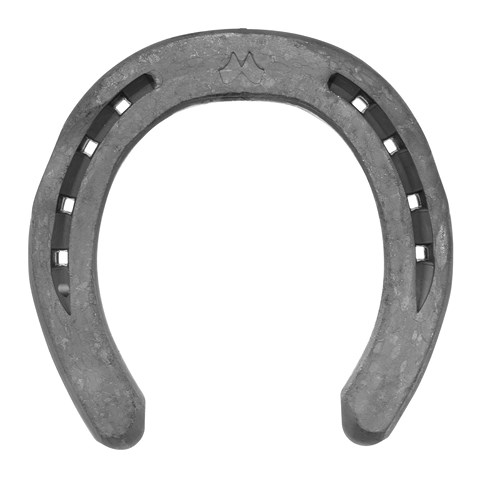 50% of horseshoes can be worn away during one shoeing cycle. The consequence of this is that the top half of the nail hole should not be relied upon for shoe retention. Therefore the redesigned crease and nail hole guarantees that the nail will always fully seat at the bottom half of the nail hole in combination with Mustad nails. The V-fuller fits seamlessly with most European style standard and long neck nails. Nevertheless we strongly recommend to use it with Mustad Concave or EXL nails for which the shoe have been specifically machine-punched. Available in 20x8mm, 22x8mm, 22x10mm, 25x8mm or 25x10mm patterns. Made from choice steel gives you the right balance between shape-ability on the anvil and durability underneath the hoof. With very low content of Carbon and Manganese, they are able to retain their shape-ability even after cooling down in water. *Other sizes. toe and quarter clipped patterns available on request.